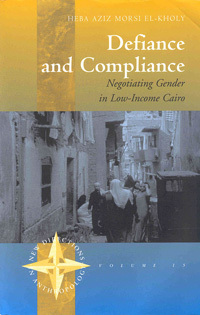 Heba El-Kholy is a development professional and social anthropologist. An Egyptian, she was born and raised in Cairo, Egypt. She holds a PhD. in Anthropology and Sociology from the School of Oriental and African Studies (SOAS), University of London and a Masters degree in development Sociology from Cornell University. Over the past 18 years, she has worked in the Arab world as a development practitioner, activist, researcher and programme advisor with a number of regional and international organizations, including the Ford Foundation, the Canadian International Devplopment Agency (CIDA), and International Quality International. She has published numerous articles related to development and poverty and is a founder and board member of the Association for the Development and Enhancement of Women, (ADEW), in Egypt. Dr. El-Kholy currently lives and works in New York where she is Policy Advisor at the United Nations Development Program (UNDP).